The October NFP report didn’t infuse the Greenback with a lot of volatility, but here are some of the more important things you need to know about if you want a quick run-through on the details of the NFP report. The seasonally-adjusted readings for non-farm employment missed expectations during the August and September NFP reports. And the October NFP report continued the trend because non-farm payrolls only increased by 161K, which is below the expected 176K increase. On a more upbeat note, the reading for September was revised substantially higher from 156K to 191K. Furthermore, the reading for August also got upgraded from 167K to 176K. That amounts to an additional 44K jobs from all those revisions. Job gains may have been a miss, but wage growth was not, since the average hourly earnings increased by 0.4% month-on-month (+0.39% or +$0.10 to $25.92 to be more exact). This is a faster pace than the expected 0.3% increase, as well as the previous month’s 0.2% increase. Even better, year-on-year reading came in at 2.8%, which is faster than the previous month’s annual increase of 2.6% and the best reading in almost seven-and-a-half years. Sifting through the details of the jobs report, the faster wage growth was very likely due to the 0.41% average increase in wages reported by goods-producing industries, which account for around 13.53% of total employment. 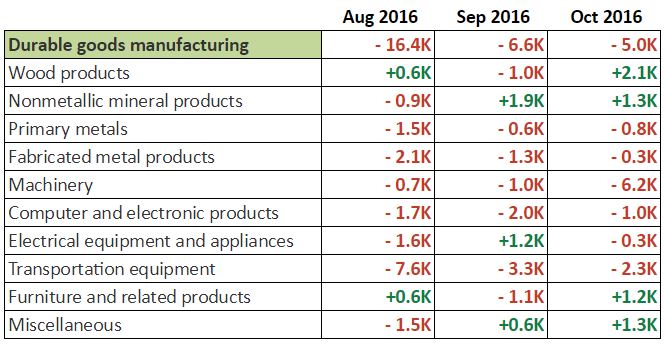 Manufacturing, in particular, saw a 0.38% increase in wages, but both durable goods and non-durable goods manufacturing reported some job shedding in October. The service sector, meanwhile, reported an average increase in wages of around 0.35%. And one of the biggest contributor to the increase in wages in the service sector was the 0.47% increase (+$0.07 to $15.12) in wages for the leisure and hospitality industry, since that industry accounts for around 10.74% of total employment. The rather large 1.19% increase (+$0.44 to $37.32) in wages in the information industry also had a significant, positive impact on average earnings, even though the said industry only accounts for around 1.92% of total employment. It also really helped a lot that the professional and business services industry reported a 0.32% increase in wages (+$0.10 to $31.07), since that industry accounts for about 14.08% of total employment. 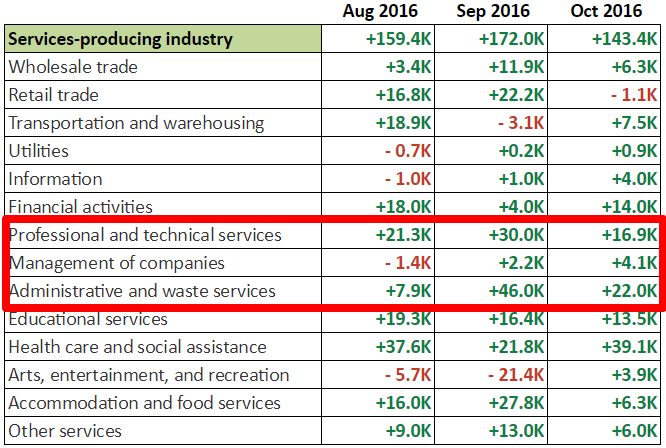 Incidentally, the aforementioned industry was one of the biggest job generators in October, contributing a total of 43K jobs as highlighted below. As expected, the jobless rate ticked lower from 5.0% to 4.9%, as the number of unemployed people fell by 152K to 7,787K. However, the number of working-age people who are no longer in the labor force also increased by a whopping 425K to 94,609K, a high not seen since May of this year. The exodus of workers caused the labor force participation rate to dip from 62.9% to 62.8%, which is a real disappointment. This also means that the lower jobless rate was very likely due to working-age Americans leaving the labor force, which is not a good sign for the U.S. economy and removes some of the shine from the “improved” reading for the jobless rate. 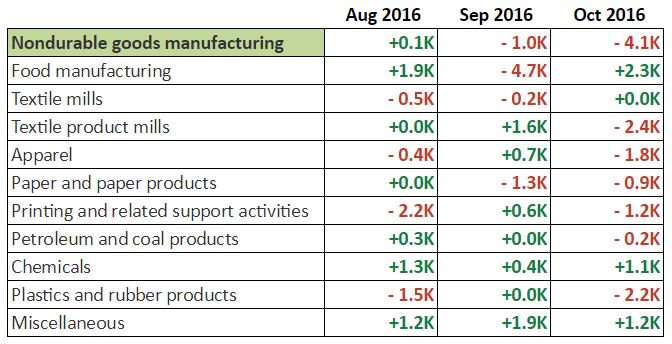 The October NFP report painted a rather mixed picture. On the one hand, the reading for non-farm employment was a miss and the “improved” jobless rate was likely due to the exodus of American workers. But on the other hand, wage growth was pretty good and the reading for non-farm employment was still above the 100K floor, which is the number of jobs needed to keep up with working-age population growth that a number of Fed officials have been citing, including Fed Head Yellen herself. Overall, it was a net positive report, though. Heck, U.S. Fed Governor and voting FOMC member Stanley Fischer even sang his praises to the October NFP report. As such, forex traders tried to buy up the Greenback as an initial reaction. However, the market seems to be giving more weight to the increasing possibility of a Trump presidency. As a result, there was little follow-through buying and there was even some Greenback selling later on. 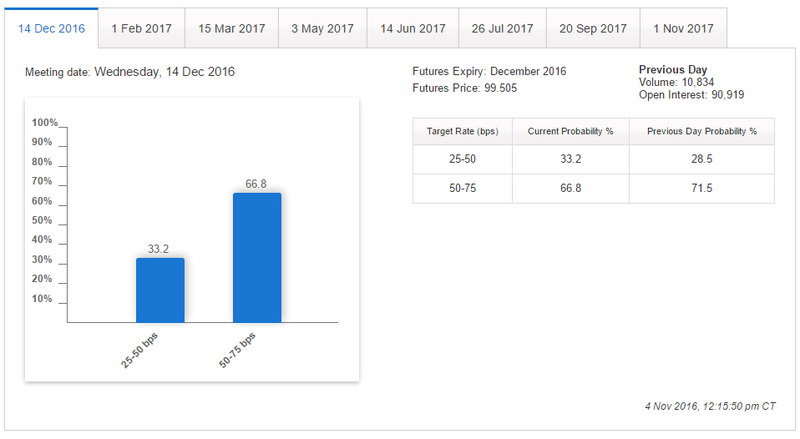 And similar to how the market reacted to the FOMC statement earlier during the week, the probability of a rate hike spiked higher after the NFP report was released only to gradually fall and settle below the previous day’s probability. And again, for those who have no idea how to read the CME Group’s FedWatch Tool, or have no idea what’s it all about, you can check out my quick primer about it here. Anyhow, given the most recent FOMC statement and the October NFP report, do you think the Fed is ready for a December rate hike? Or maybe the next U.S. president would be the deciding factor?